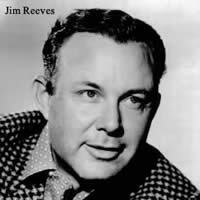 Welcome to our Jim Reeves song page. We include some all-time favorites along with chords and lyrics including chord charts for right and left-handed guitarists. Beginners will enjoy playing most of these songs as the chords are very easy to play... excellent practice songs. Jim was born James Travis Reeves on the 20th August, 1923 in Galloway, Texas, U.S. He died in a plane crash at the early age of 40 on the 31st July, 1964 in Davidson County, Tennessee, U.S. He was truly one of the greatest country singers of the modern era with a host of memorable songs which will remain timeless... and a voice to match. All chords and lyrics are provided for educational purposes and personal use only.